Guys, register for 1 day Unlimited Text on Sun Cellular. You can send unlimited text messages 1 day or even in 1 week! Just choose from the promos below and follow the guide to avail the promo. 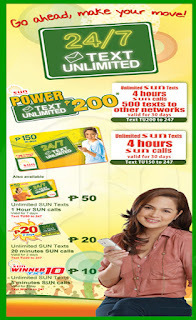 Sun Cellular 1 day Unlimited Text is low as P10.00. 7-days or 1-week Unlimited Text to Sun friends plus the 1-hour free call to them. Unlike the other UnlimitedP150, UnlimitedP200 has 30-days unlimited text and 4hours bonus call to Sun friends, it has also 500 Free Texts to Other Network.